The 0401 Stationary Truck Shelter is the perfect options for dock openings 11’ x 10’. It is one of the most versatile shelter that is available. It covers a wide variety of door sizes and handles an even wider variety of trailer sizes. There is little maintenance or service involved with the series 0401 and has an extremely long life span. The frame is made with sturdy galvanized tubing that will not warp, rot or twist. The series 0401 standard dimensions for door openings up to11’w x 10’h are 11’6”w x 11’h x 24” projection with 21” wide vertical panels and a 36” drop header panel. With a dock height of 48” the Series 0401 seals trailers from 11’6 to 13’6 high. This series also seals trailers with width from 8’0 wide. 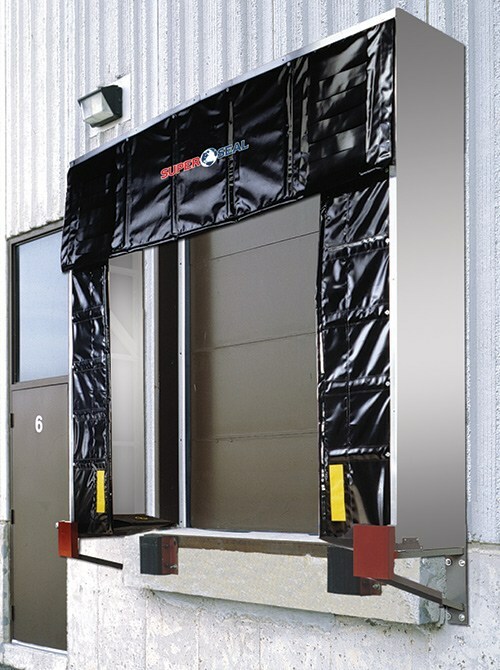 It can be designed to suit a large variety of oversized door openings, widths, or dock projections. The unit framework is constructed of 1 ½” x 1 ½ galvanized steel tubing covered with galvanized cladding. The header framework is peaked to allow adequate drainage. The vertical panel contains fiberglass stays, the top tree three being a “Z” pattern to keep the curtain straight at all times. Vertical panels have a double layer of fabric at the leading edge impact area and a 4” wide x 14” high yellow guide stripe to aid in spotting shelters. The header panel to full height fiberglass stays and overlapping protective flaps at trailer impact areas. The header panel has elastic wind straps to keep the panel in position. All stays are confined in multi-layer reinforcement pockets. Leading edge of vertical and header panels have sewn in foam bead for a tight seal. Double stitched, high strength twisted 4 ply 100% polyester boned thread is U.V. treated sewing throughout. All exterior front frame edge is trimmed with aluminum angle to provide a neat, clean finish. Unit comes with all necessary mounting hardware that is galvanized to resist corrosion. Optional protective steel guards are recommended for added protection and support.